Singer/songwriters come from all walks of life and can be found in every city across the United States. For some reason, however, the best of these always seem to call Texas their home. Such is the case with Jimmie Dale Gilmore, who began his career nearly thirty years ago as a member of The Flatlanders. He became a star of his own accord before their lone album was ever released, but the band, which also featured Joe Ely and Butch Hancock, is legendary nonetheless. 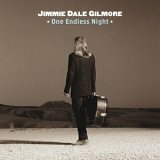 On his sixth solo effort One Endless Night, Gilmore contributes only three new compositions. The title track drips with sorrow and regret, Blue Shadows shimmers like a forgotten outtake from Willie Nelson's Teatro, and DFW bubbles with all the excitement of a heavily caffeinated flight home. Gilmore fills the remaining time paying tribute to his peers and heroes. Despite this, One Endless Night is still a cut above the rest. Gilmore calls himself a "song lover" and as such he makes each selection his own. The unusual choice of Mack the Knife is given a haunting, menacing twist; the Grateful Dead's Ripple is gorgeously treated as a backwater country anthem; and John Hiatt's Your Love is My Rest is fitted with Byrdsian guitars — so much so that wouldn't sound out of place on one of Roger McGuinn's solo efforts. Throughout the disc, Gilmore's voice floats like a plaintive cry above the sweetly simple melodies of his backing band, and he emotes honesty, retrospection, and tenderness with each word he sings. There's truly nothing complex or overly ornate to be found on One Endless Night — just good old-fashioned, dusty, Texas songs tackled with superlative imagination and sincere beauty. One Endless Night is available from Barnes & Noble.